Besides enjoying their July 4th Allergy~Friendly Crepes, my kids enjoyed their first dairy-free vanilla dipped ice creams coated with dark chocolate crispy rice crunchies. I know what you're probably wondering. Milk-free? Soy ice cream? NO SUGAR added? And you'll see according to their ingredient list, they are also egg-free and nut-free. Can these ice cream bars really have any taste? As usual, Tofuttis did it again. 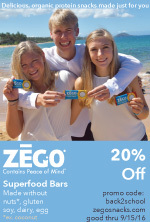 I think these bars are delicious and had to sneak two myself. Good thing my kids weren't looking. 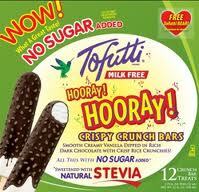 Tofutti MILK FREE Hooray Hooray Crispy Crunch Bars, distributed in the USA by Tofutti Brand Inc., Cranford, NJ. 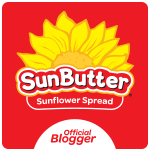 Be sure to visit their website to learn more about their personal business story, recipes, where to find them, frequently asked questions and the many different products they have to offer. David Mintz, a Brooklyn restaurant owner, created Tofutti frozen desserts as he was searching for milk-free alternatives for his kosher restaurant. Thanks to the manyTofutti products available, living with dairy allergies is much easier. I bake and cook with the sour cream and cream cheese regularly, my daughter loves the cheese slices, and we all enjoy every variety of their Cutie ice cream sandwiches. As I tell my kids often, 'we can eat the same foods as everyone else, we just use different ingredients', and they're often Tofutti's! Now to find the Chocolate Dipped Mint by Mintz variety!